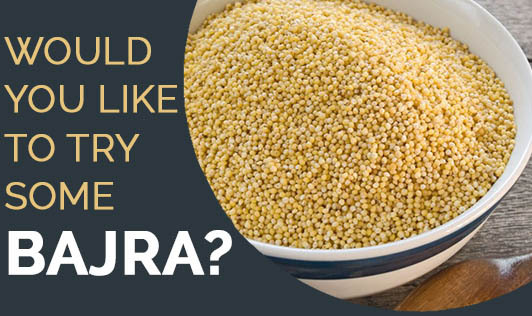 Would You Like to Try Some Bajra? • Medicinal properties when bread made out of it is eaten with honey in the morning especially for patients with bleeding piles, high blood pressure, insomnia, diabetes and impotency. • It is high in protein when compared to other cereals. • It is high in essential amino acids methionine, cysteine and lysine. • Bajra is also known to be a rich source of vitamin- E, B-complex, potassium, zinc, magnesium, calcium and iron too. • Since Bajra is gluten free, it would be a good choice of food for people suffering from celiac disease. • The presence of niacin and phytic aid in Bajra helps reduce cholesterol. • Since it is rich in fiber, it is usually mixed with other flours to make multigrain flour which would help control diabetes and maintain cardiac health. It is also known to reduce acidity as well. Note: People with kidney and rheumatic diseases should consume Bajra in a limited amount as excessive eating can lead to uric acid deposition in the system.